As a project manager, capturing meeting notes, illustrations and action items is an essential part of the job. Setting aside time to complete this responsibility can be a daily chore. Microsoft OneNote makes this easy to do. Tools which make the admin part of my job more efficient frees up time to be more effective on project management. Think of OneNote as a notebook on your laptop or tablet. In fact, you can access the same notebook regardless of device you are using (desktop, laptop, smartphone or tablet). You can capture meeting notes and draw diagrams, although this tends to work better with a stylus pen on a tablet or touch-enabled laptop. 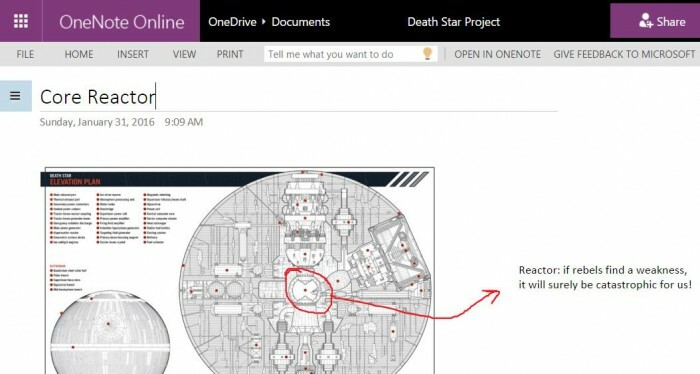 You can capture screenshots and draw over those in OneNote. There is also a feature to record a meeting as an audio file, a handy feature for college students. You can organize by notebook, section, and page. I like to have a notebook for each project. Within each notebook, I create a ‘section’ by subject. For instance, a section for each vendor, or a section for each project team (when you are managing a program), or a section for UI discussions which have a lot of screen grabs. A page is within each section, and it could refer to a meeting date or specific topic with that subject. Sometimes you have these impromptu discussions which you are not sure which subject it might belong. In those cases, just start a page in a “Miscellaneous” section, as you can move or copy pages to other sections (or even other notebooks) very easily. As you jot down meeting notes, diagrams or screen captures into OneNote, you can also highlight things as action items or priority items. My brother, who also uses OneNote religiously at his work, has a color coded system in place, and “blue chips,” “red chips” and “white chips” have even changed the workplace vernacular. 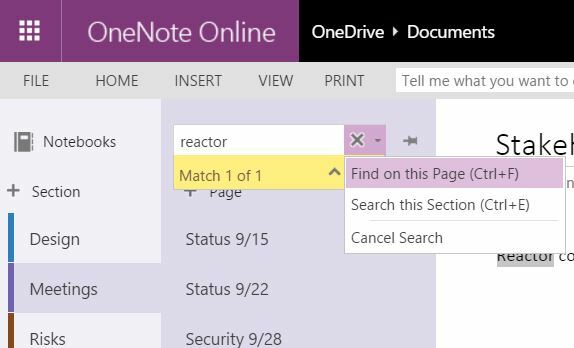 Search is a cool feature in OneNote. Let’s say you’re looking for something mentioned in a meeting a few months ago. This will save you. Lastly, you can store your notes on your personal device or in the cloud. If you choose the cloud option, it will sync up with your device very smoothly, very quickly. If you don’t have a network connection, you can still use OneNote locally and it will sync up with the cloud later when a network connection is made. 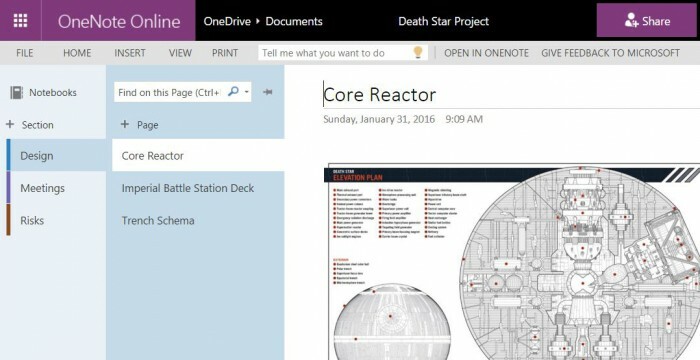 There are so many ways you can use OneNote that it can be a little overwhelming at first on how you can organize. So if you are starting out with OneNote, I would say just start off first with one notebook and one section in the notebook. As you begin taking notes, you’ll figure out the best way to organize your notes, and OneNote makes this easy to do, too. Another feature I wish OneNote had was a predefined notebook ‘mode.’ For instance, I wouldn’t organize my classroom notes in the same way that I organize my project meeting notes. OneNote can also be used to create tasklists or even as a photo album. I am still trying to figure out the latest method of ‘sharing’ my notes. For instance, sometimes I may only want to share a single page, and not the whole section or not the whole notebook. On my desktop or laptop version, I can simply select “Send Page” and email the notes to the meeting participants. It’s a little confusing how this works with the online version of OneNote, and so what I end up doing is a copy/paste into an email and then send it out to the meeting participants. For the online version, I believe other meeting participants can add their own notes or comments to your page, but I haven’t used this feature yet, and I have no experiences to share with it. Also, with the online-only version, you can’t draw with it. But if you download and install the program onto your computer or install the app on your mobile device, then you can draw with it. Recommendation: just download the app to use on your tablet (the IPad Mini 2 is my preference)! There are ‘featured apps’ for OneNote, which are worth exploring, but fall short of what they state. For instance, if you prefer to write with a pen and paper, there are printer apps which allow you to scan your page on your printer and send them directly to your OneNote notebook. There is also OfficeLens which I had high hopes but does nothing more than allow you to take a picture directly from your smartphone and drop it into OneNote. The way that I interpreted these tools was that it would recognize designs, for instance, and OneNote would recognize and create shapes for your to continue your discussion elsewhere. For example, let’s say you are having a kickass design discussion, but you are getting thrown out of your conference room. Your design is incomplete, so OfficeLens should take a picture, transform the images into shapes and let you pick up the design discussion later. But it falls way short and just takes a picture. I have faith and hope in Microsoft, however, that one day they will figure this out. Lastly, there is a OneNote plugin for Outlook, but my impression is that it’s limited and doesn’t work like you would expect. For instance, I think if you use Outlook to set up a meeting, the plugin should allow you to click a button to create a page in your notebook and send out notes to participants at the end of the meeting. 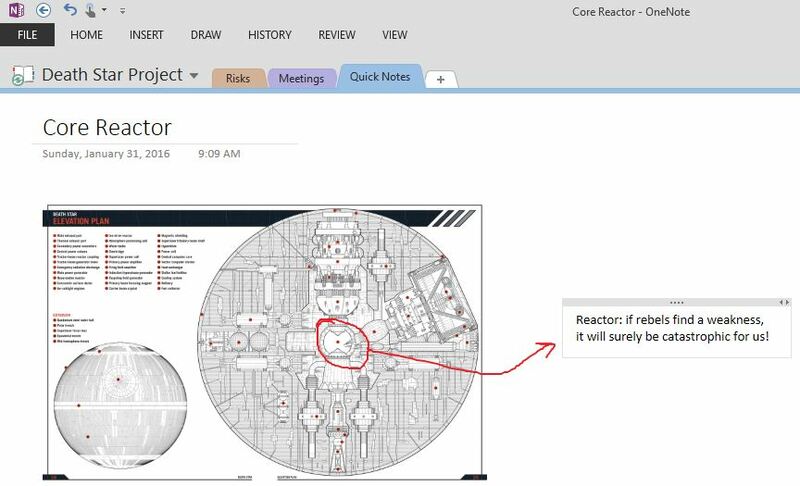 Microsoft’s OneNote is a powerful, free tool, but project managers should remember that it is just a tool. You use it to be more efficient with your work, but don’t let project management administration consume you. The same can be said about Microsoft’s Project software or Atlassian’s JIRA. In my opinion, don’t spend more than 10-15% of your time on administrative tasks; focus on being the project manager instead. Share your usage of Microsoft OneNote tool with me!